Treasure is learning to push a skateboard. While this doesn't sound a lot like something that should be in a fitness program, I am finding that it is harder for her than I expected it to be. Treasure enjoys any trick in which she can put her front feet up on something, so I thought this would be easy for her to learn. What I am finding, however, is that it is a difficult concept for her to move only her back feet and keep her front feet in place. 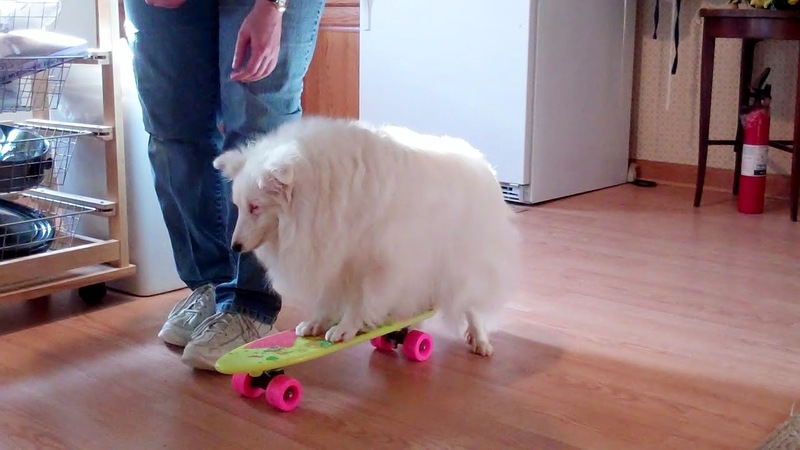 She often tries to walk her front feet forward as well, and ends up walking up to the end of the skateboard instead of keeping her front feet in the middle. Learning to isolate and only move her back feet is a new skill for her. While she is learning new skills in proprioception and is connecting new neural pathways to allow her to learn this new motor pattern, she is also working her muscles in a different way. So, short sessions that are kept fun are important to prevent her from getting sore and frustrated. Chicken pieces help to keep her motivated and having fun too! try a strip of sandpaper on the board - she can feel the different texture and learn to keep her feet on it because they won't slide so much on a rough surface.